In one of the more compelling match-ups, Eric Ellington will face Jordan Howard at bantamweight. In this dual Q&A, Ellington and Howard discuss each other and their Road to Bellator 197. Since being named the 2016 STL MMA Amateur of the Year, Ellington has steadily climbed to 4-0. He went 3-0 in 2017, culminating with a unanimous decision win over Johnnie Roades at November's SFC 298. In February, he took a short-notice fight up two weight classes against Kagen Mullen at SFC 302. Ellington took it to Mullen and scored a finish late in the third round via ground and pound. The 29-year-old out of the Academy of Courage is taking a step up in competition when he faces Howard (10-4). You have quietly become a 4-0 pro, including a trip to lightweight for your last fight. "I just know that my first couple of fights were not against the toughest. They weren't weak, but not up to my level. But we have upped the competition a little at a time. I took that (last fight) on 24 hours notice against a guy who hadn't fought in a few years. It was a high-risk decision. But I really felt that if I did what I do best, no problem would I get the win." As an amateur, you had plenty of big nights at the Family Arena. Your Fight Hard MMA bantamweight title win over Jon Rosener in June of 2016 was there as was a victory over Trevon Crawford among others. How does it feel to come back? "I have missed this place. It is where I built my name and my brand. I gained a lot of fans here, and I hope to see some of the ones who have helped me from the beginning on April 13." Where do you feel that you have the advantage over Jordan? "He expects me just to come out and out-wrestle him. I will be stronger. I will be bigger. His cardio has helped him out a lot during his career, so I have been running a lot and doing a lot of movement drills. He likes to push the pace, and I'm ready for that. I'm in way better shape." There is an experience gap. It will be Jordan's 15th pro fight and your fifth. "I have been watching this guy for some time. He has been in the back of my mind ever since I was an amateur and he won the SFC 135 belt. I saw a lot of good things and even learned a few things from him. But I feel like it's my time." You are going on year three of working, volunteering, and coaching at the Jackie Joyner Kersey Center, what do you get out of that? "I enjoy seeing the growth of the kids. Just watching them mature and make better decisions." It had been five-and-a-half years since Howard tasted defeat. In his last time out, Howard lost a unanimous decision to Brandon Black (5-3) in December at Bellator 189. Howard was dropped early in that contest but toughed his way through. Howard, a former Shamrock FC title holder, is 10-4 and had put together a nine-fight win streak. Howard comes from a fighting family with his father Rob being a former competitor and promoter and his younger brother Corbin coming up in the ranks. The Howards run and operate Howard's ATA Martial Arts with locations in Jefferson City an O'Fallon and Jordan has taken over the reigns of the gym located in Manchester. Eric Ellington is known as a strong, straight-ahead wrestler-type. What do you expect to see? "I think he's a great prospect for the area, but this performance will definitely show you the difference between a regional prospect and a national prospect. I look forward to competing against him and I'm excited just to have the opportunity to fight at home, and I couldn't ask for a better opponent." You recently opened a new Howard ATA affiliation in St. Louis in Manchester. How has that been? "We opened at the very end of 2017 and hit the ground running in 2018. This is my first full training camp at St. Charles MMA, and I've been really busy there and very happy with the camp we put together. " You are coming off a loss, your first one since 2012. What was your takeaways from that fight? "It was definitely a humbling experience, and it was something to help make me hungry again and fire me up for this next fight. I was trying to do too many things at the same time without enough emphasis on training and thinking I had learned everything that was to learn. It was a great experience to teach me that there is always more to learn. I was excited to get to make a comeback after my last fight in front of my fans, in front of my hometown." Did the lack of preparation cost you the fight? "Yes and no. My conditioning was good, and physically I felt good. It was just that technically I felt there were things I could have improved on. After going back and watching the tape, there were definitely things we could have tweaked or modified to my striking and wrestling." With the win streak behind you, does this feel like a new chapter? "I didn't start off with a winning streak. I started off with one win and three losses in a row. I already learned the hard way that if you want to be a successful pro that you have to put in the work and that you have to train like a professional." 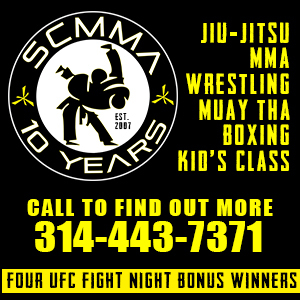 With the new gym, a full-camp at SCMMA, and now the fight here in St. Charles, it feels like you are cementing your flag in the St. Louis area. "I feel like I have always been in the area. Our school in Jeff City is only an hour-and-a-half away. We have a lot of fans coming from that school and to have a new group of fans coming from the school in O'Fallon and now the school in Manchester. We're going to have a huge cheering section for Team Howard. You will see the Team Howard shirts, and they will be out in force, and they're going to make some noise."